Stacy Hubbard is a Master Trainer for the Gottman Institute, a Certified Gottman Therapist and a Trauma therapist. M.S. Portland State University, Portland, Oregon (Marriage and Family Therapy) 2005. B.A. St. Mary’s College of California , Moraga, California. (English Literature). 1993. "There were also many points where I had to talk people through gripping fear, doubt, and pain to keep going and take one more step. That was a really powerful experience for me and it certainly groomed me to be a therapist and deal with emotional difficulty and pain." I believe that couples work is the most powerful impact I can have with people. Being able to strengthen a relationship leads to better quality of life for both of them. It allows them to feel safe and comforted in this crazy world. It encourages them to be better parents and be more present in their friendships. People feeling included, loved, attached, and safe within their primary relationship will allow the world to be a more generous and kind place for all of us to live. I work effectively with couples who are in significant distress and have problems managing conflict. I do not shy away from helping couples who are in serious distress and who've have major conflicts and pain built up between them for years. I work with the "attack-defend cycle" and helping couples get through these unsettling, high conflict patterns. I know that I have the tools to give them in order to help them have a healthier connection and better communication and a deeper friendship. I specifically delight in helping couples heal from affairs. Working through that trauma, and the betrayal and discovering how to create a new marriage using the Gottman “Atone, Attune, Attach” method has been very rewarding for me. To see a couple on the verge of divorce and in pain come through the fire to the other side, happy and moving forward in their new marriage is my biggest reward for all the hard work. The fact that they have their marriage after all the pain and now have the rest of their lives together is something that really warms my heart and makes me so happy to be doing what I do. I also enjoy helping couples build shared meaning, a sense of being on the same path together, and being able to plan the future, have more fun and adventure- and at the end of the day be good friends with each other. I am proud to be a master trainer with the Gottman Institute based in Seattle Washington. That means that I train other therapists in all three levels of the Gottman method and do consultation for therapists seeking to be certified in the Gottman method. Of course, I also do private therapy at my office in Ashland Oregon. I love sports. I spend my free time exercising. I love CrossFit and have been competing in CrossFit competitions over the past few years. Every year I go to the March Madness basketball tournament with a group of friends. This past year it was Boise, Idaho. I watch college basketball all season and the NCAA tournament is a really fun event to culminate it all. I have a long background in athletics. I was a gymnast for many years, then played volleyball, basketball and tennis in high school. Then in college I played Lacrosse. I then played competitive Ultimate Frisbee for about 15 years, traveling internationally to play with my Portland, Oregon-based team. This career culminated in playing in the finals at the national championships in Florida, which qualified us to play in the World Championships in Perth, Australia. That was a lot of fun! I teach clinicians how to use the Gottman method of couples therapy. I'm currently teaching level one, two and three, as well as providing consultation to those seeking to become certified in the method. I facilitate the 2 day Art and Science of Love couples workshops, which allow couples to learn to employ the method in their own lives. In addition, I have created a new workshop in collaboration with The Gottman Institute, called “The Seven Principles for Singles.” It is focused on helping single people learn the skills and the research behind the method so that they can attain healthy relationships. I live in a very beautiful place! There is nature everywhere! It is a place with beautiful mountains, rivers and trees. We are also lucky to live in a place with a world-renowned Shakespeare Festival that has some amazing theater. We have an outdoor music venue, and some really amazing restaurants and wineries. If you love rafting, hiking, fly fishing or mountain biking- this is the place for you! 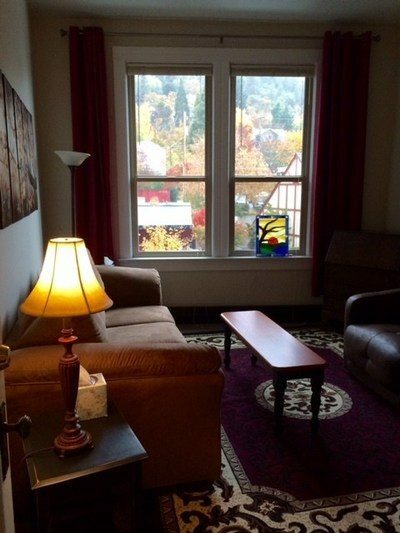 I have a cozy and very sweet office in downtown Ashland, It overlooks the hills and Main St. of Ashland which is a very quaint hamlet of a town. Within a stone throw of my office there are dozens of high-quality restaurants and cafés, juice bars and coffee shops. There are also a lot of very cute shops and the shopping in Ashland is simply amazing. Not only for clothing and shoes but for art, books, jewelry, antiques, records… everything you can imagine. Amazing! - Mt Shasta, California 1 hr 20 min. - Redding, California 2 hours 19 min. Earlier in my career, I was an Adventure Guide and led backpacking, rock climbing and rafting trips for many years in the Central Oregon Cascades. I also worked for Outward Bound in the Boundary Waters Canoe Area Wilderness of Minnesota which was a remarkable and important experience for me. This work taught me to have hope and persistence. I remember being cold and wet in the middle of a rainy backpacking trip. I was sure that the rain would never end. But I learned to have a hold on hope and even good humor. Inevitably when the sun did come out it would be such an amazing experience for everyone. You could see the mood shift. It taught me much about persistence and pushing myself farther than I ever thought possible. Staying on a climbing route even when it gets really difficult and scary but knowing that if I can stick with it I would get to the top. There were also many points where I had to talk people through gripping fear and doubt and pain to keep going and take one more step. That was a really powerful experience for me and it certainly groomed me to be a therapist and deal with emotional difficulty and pain. For me, having that experience helped me to be able to help others go to places they didn't think they could go, I have learned to lead by example with hope, persistence and know-how at the heart of it all. I also worked in an agency setting for many many years. I worked my way through Graduate school in Portland, Oregon while working at a residential treatment center called Albertina Kerr. There I worked as an online staff in the subacute secure psychiatric stabilization unit, and long term residential units for children and teens. I was a therapist with the intensive community-based treatment unit and eventually moved on to be a therapist and clinical supervisor for Catholic Community Services which provides in home services for children with severe mental health concerns and their families. This job required being on call 24/7 and there were often trips to the E.R. at 3am to do safety planning and stabilization with acute mental health crises. I have also recently worked for the Children’s Advocacy Center which is a wonderful place that allows children who have been abused or neglected to receive forensic interviews, medical services and therapy all in one child friendly and comfortable setting. It was at this center that I was trained in EMDR therapy (eventually becoming certified in EMDR by EMRIA). I used this treatment modality with severely traumatized children and have continued to use EMDR with adult clients who have experienced trauma. My clinical work with clients in severe distress in the inpatient or agency settings has really cemented that need to be calm under fire and to be there when times are toughest, knowing that things can get better while working hand in hand with my clients. I would say that persistence is a huge quality of mine, it has helped me achieve so many goals in my life. I also really enjoy being silly and funny whenever appropriate. Anyone who knows her will tell you the same. She keeps greeting card companies in business, as she is always sending cards and letters to relatives and friends. She is generous and always thinks of other people first. She taught me how to be honest, hard-working and kind. We once played the Gottman open-ended question card deck and found out that if we both had unlimited money we would start a dog rescue shelter…she added that she would also include homeless people in that rescue. I LOVE my dog Monty. He is a rescue dog and is a giant ball of personality and love. He is half German Shepherd, half Standard Poodle. We go paddle boarding together - and yes, he rides on the board with me. See the photo below for proof! Finally, I am an amateur stained-glass artist, and roast my own coffee. And relish in drinking the fruits of my labor! I'd love to work with you. Reach out and let's talk.